The tester is a motor driven instrument for moving a weighted test strip over a printed specimen through an arc. The SUTHERLAND® Rub Tester has been redesigned to improve its operation. James River's corporate research and development laboratories did extensive testing of the SUTHERLAND® Rub Tester. The result of this work is an affordable abrasion testing instrument that retains all the features that made it an industry standard plus improvements that ensure it will remain the industry standard. Illustrated is the SUTHERLAND® Rub Tester showing two-pound and four-pound weights to which test specimens are attached and the scoring device. The SUTHERLAND® 2000™motor now has four speeds; the first speed (21 cycles per minute) is half the speed as the older models, which will make the "wet" tests, and tests using under 5 strokes easier to perform. The second speed (42 cycles per minute) and third speed (85 cycles per minute) are the same as the older models, while the fourth speed (106 cycles per minute) is faster. These new improvements will allow the customer the ability to customize the testing procedure more to their individual product, yet maintaining the ability of duplicating a procedure used by someone with an older model unit. The higher speeds will reduce the long test times needed for certain types of substrates (plastics, UV varnished, printed films, etc.). The SUTHERLAND® 2000™ incorporates a digital counter with a fiber optic sensor to ensure the accuracy of the number of rubs for a given test. Simply enter the number of rubs desired and the instrument will stop automatically at exactly the correct number of strokes. A supply of 80 x 80 count bleached muslin cloth (cloth not included) has been found useful in testing wet smear, wet rub, and wet bleed. 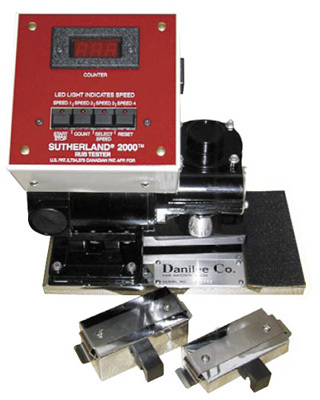 The Sutherland Rub Tester is designed to evaluate the scuffing or rubbing resistance of the printed or coated surface of paper, paperboard, film, etc. The test results are reproducible. This heated weight provides a uniform test for evaluating the "hot abrasion" resistance of printed cartons, labels and periodicals. Where required, rub resistance specifications may now be based on number of strokes at a given temperature as well as pressures. Two-pound weight, four-pound weight, and a scoring fixture, calibration certificate, picture tutorial, and manual. Additional accessories and replacement parts are available.